In the coming weeks, Nieman Watchdog will lay out the views of experts, pointing reporters to story ideas on the causes of the disaster and the economic choices the country now faces. This piece, by Henry Banta, spells out what has gone wrong – and why it is so important for the press to do a better job. We all know that we are in the midst of a major economic crisis but the causes of this disaster are a mystery to most Americans. With a few exceptions, the news coverage has never explained how the collapse of the subprime mortgages market could have triggered a massive financial crisis causing hundreds of thousands of people to lose their jobs and their houses. Even more inexplicable are the world wide consequences such as the collapse of the housing industry in Spain or the horrible effects on millions of lives in Africa. The political debate in the wake of the crisis has been conducted on a very low level. Without an understandable explanation for what happened, the public has been given nothing even resembling a rational policy debate over what to do about it. The coverage of the stimulus program by the major media was confined to the Administration’s quest for Republican votes with virtually no attention paid to the substance of the issues. Thus, even attentive citizens are consistently left with little or no understanding of their own interests, or the country’s. What is complicating the media coverage and the public understanding of the disaster is that there is no “story” in the conventional journalistic sense. The obvious villains alone could not have caused the crisis. Of course, there was Wall Street’s greed, and there were villains like Bernard Madoff who were exposed by the downturn. But they certainly didn’t cause the disaster. Greed and villainy are, more or less, constants in the economic world. What failed was a willingness to police the financial markets. It was in large part an intellectual failure. Government policy makers – from Cabinet members, members of Congress, down to low level lawyers at the SEC – approached the regulation of financial markets with a set of assumptions that were just plain wrong. In the simplest terms, they believed that markets left to their own devices could be relied on to self-correct. They were flat wrong, of course. The thinking was that markets had been always rational and efficient. There could be no speculative bubble followed by panic and disastrous collapse. There would be no bubbles in the financial markets because economic theory had taught that there could be no bubble. Markets, being rational and efficient, could be relied upon to accurately price financial assets. Hence: no bubble. Lessons of the past could be – and were – dismissed. A veritable academic industry developed to prove that there never had been a bubble in any market. The tulip mania in 17th century Holland, the South Sea bubble in 18th Century England were dismissed as folk legends. The Great Depression was blamed on the failure of government and not on any defect in the economic system. By last Fall this efficient market theory was, if not dead, badly wounded. 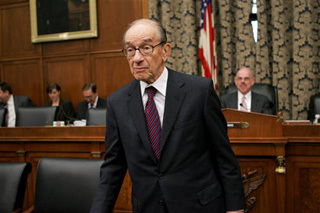 The climactic moment came when Alan Greenspan, former chairman of the Federal Reserve and leading proponent of the efficient market theory, told a Congressional committee that its “whole intellectual edifice collapsed.” Perhaps the most spectacular mea culpa in the history of economic thought. The real story, about why so many believed in the efficient market theory and why it caused them to make colossal mistakes, has not been driven home to the general public. Of course students of economic policy know how profoundly the shock wave from last year has shaken the foundations of conventional economic thinking. But save for the analysis of a handful of writers, the story has never made it into the news. Yet, without that story, it is impossible to have a rational political debate about what do to get out of the trouble we are in and prevent it from happening again. Talking about this issue will offend a lot of people and challenge many deeply held beliefs. The rational efficient market theory underlies the political values held by many people who have never given the theory a second thought but who simply like the conclusions it supports. To point out that the economic support for their convictions has met a violent end will not be well taken. The efficient market theory had many followers, not because it was so compelling – many of its assumptions offended common sense – but because it fit neatly into the agenda of powerful interests. But if we cannot deal with the mistakes of the past how do we deal with the future? If bad economic theory got us into this much trouble, shouldn’t we be asking our current policy makers about their economic assumptions? Shouldn’t we be asking about the theory underlying current decisions? And why should such discussions be left to a few experts? Let me be specific, and put the issue in the context of a conversion that was held on a Sunday morning “talk show” a few weeks ago. The person being interviewed was Republican John Boehner of Ohio, the House minority leader, who denounced the “stimulus” program of the Obama Administration as “mere spending.” This was a splendid opportunity to open an intelligent debate on the subject. A knowledgeable interviewer would have known that in economic terms a recession represents a gap between the falling level of private spending and the level necessary to keep workers employed. The purpose of the stimulus program was to partially fill that gap with government spending. If Boehner was opposed to government spending just because it was spending, certain obvious questions should have suggested themselves. What was his belief about how markets behave and on what was it based? The questions would have provided an excellent point from which to ask basic questions of the Administration. But nothing like this was ever asked and the opportunity for stimulating a real debate was missed. I certainly agree that enforcement of government regulations might have prevented the collapse. So, yes, the media ought to be calling for a thorough, honest appraisal with a view to ensuring we never again face a similar meltdown. The public still seems blithely unconvinced of the need to bridle capitalism.